Fidra, the environmental charity behind the UK’s Cotton Bud Project welcomes the UK Government’s consultation on proposals to ban the distribution and/or sale of plastic straws, plastic-stemmed cotton buds and plastic drink stirrers in England and supports a ban on the distribution and sale of plastic-stemmed cotton buds . Legislation is an important part of changing the way we use and value plastics. Banning the distribution and sale of cotton buds is a progressive step that will be welcomed by everyone who has seen cotton buds polluting our beaches and harming our wildlife . Plastic cotton bud stems make up a significant proportion of the sewage-related debris found on UK beaches. If flushed down toilets, their size and shape mean cotton buds slip through wastewater treatment systems, wash into rivers and seas, and end up on beaches. Not only are cotton buds unsightly, but they are a danger to wildlife  and an indicator marking the trail of sewage from bathroom to beach. Plastic cotton bud stems were the 8th most common item found on the beach in the Marine Conservation Society’s 2017 Beach Clean Report  with an average of nearly 27 stems found per 100m; During the 2017 Great British Beach Clean a total of 1,235 cotton buds were found on just 5 separate beach cleans (a total of 500m beach surveyed) along the Essex coastline, England. 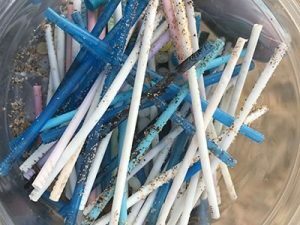 In August 2018 over 367 cotton buds were found along the strandline of Perran Sands beach, Cornwall. Banning the distribution and sale of plastic cotton buds is a small but vital step on the journey to end plastic pollution. It highlights the broader issue and encourages businesses, government and people to take further action. Since 2013, Fidra has been encouraging manufacturers and retailers stop making and selling plastic cotton buds and change to plastic-free alternatives such as paper. Johnson & Johnson Ltd was the first to commit to stop manufacturing plastic cotton buds in 2016. This was followed by most of the major UK retailers committing to make the change away from plastic cotton buds. The ‘Good Buddy List’ of retailers and brands which do not have plastic stems can be found on The Cotton Bud Project’s website. Fidra’s Cotton Bud Project supported by our partners and the retailers who have already changed to paper stems, led to the Scottish Government publishing draft legislation (The Environmental Protection (Cotton Buds) (Scotland) Regulations 2019) in the London Gazette and Edinburgh Gazette on 3rd September 2018 banning the manufacture and sale of plastic stemmed cotton buds in Scotland. 99.4% of respondents to the consultation preceding this legislation, supported a ban on plastic stemmed cotton buds, including Boots UK and Waitrose. Fidra set up and runs The Cotton Bud Project. Fidra is a Scottish registered charity (SCIO no. SCO43895) based in East Lothian, Scotland. It seeks to engage local concerns over current and emerging environmental issues, and use this to contribute to a wider dialogue at national and international levels. More information on the issue and Fidra’s efforts in solving this issue can be found in this blog. Industry has shown change is possible.
. Plastic cotton bud stems are a danger to marine life and have been found in the stomachs of fulmars and loggerhead turtles. They are known to cause deaths due to damage to internal organs. In addition, plastics in the ocean act like a sponge for chemical pollutants such as pesticides. Toxins which may be present at low amounts in the water can build up to high levels on plastics as they are soaked up from the surrounding sea. See The Cotton Bud Project for further details.